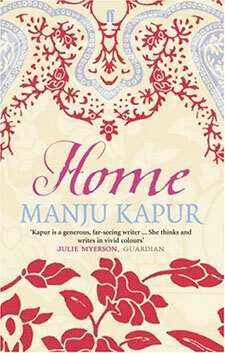 ‘Home’ is the first novel of Manju Kapur that I read recently. Though, she attained fame with her first novel ‘Difficult Daughters’, which I haven’t had the fortune to read as yet, her ‘Home’ has indeed stirred my interest in reading her books. ‘Home’ revolves around the family of Banwari Lal, a Sari Seller of Karol Bagh in Delhi. Banwari Lal is a migrant from Pakistan and is proud of the Sari Business he could set up in Delhi with his meager resources. He firmly believes in the ethos of a joint family and as a true patriarch, is ready to do anything for family honour. However, his principles are challenged by none other than his elder son, Yashpal who falls in love with Sona and marries her after a raging emotional blackmail of his family. As luck would have it, Sona could not bear a child for ten long years and becomes an easy target for the usual bantering by the women of the family. The second blow to Banwari Lal’s joint family comes from the disastrous marriage and suspicious death of his daughter Sunita, who leaves behind a son, Vicky. Banwari Lal brings Vicky in his household despite opposition from the other family members and due to the underlying bias, Vicky becomes the black sheep of the family who is resented by everyone partly for his misfortune and partly for his bad behaviour towards Nisha – the loving daughter of Yashpal and Sona, who is born after ten years of rigorous prayers of her mother and is apple of everyone’s eyes in Banwari household. With time, the usual rift is noticed between the brothers and owing to modernization, the ‘Home’ is fragmented to self-contained flats. The story progresses at a fast pace and soon becomes entangled with the grand children of house, of whom, Nisha is the main protagonist. Manju has described the tumultuous growing up years of Nisha in a heart rending manner as Nisha is abused by her Cousin, Vicky and though the family elders have an inkling of Vicky’s incestuous behavior, they do nothing, owing to family honor. When she grows up, she starts going to college and gets romantically involved with a boy, however the affair fails and Nisha is left heartbroken and is infested with a disease that spoils all her beauty. The external beauty is bargained with the internal strength and confidence of Nisha and she becomes an independent business woman. After a lot of ups and downs, she at last marries a widower and gets settled into a Home. Manju kapur has tried to put a lot of issues in this book which are commonly encountered in a joint family and are usually kept under the carpet to protect family honor and name. A lot of scheming and bantering usually goes on behind the curtains while maintaining the outer sham of a big happy family. The author has tried to bring some of those issues to the fore and due to this, Home does not remain a simple story of a Karol Bagh sari seller, but gets a more universal color and makes an invigorating family saga. Though, I felt that due to the large number of characters involved, Manju has not been able to do justice to each one of them, and some of the sub plots are not fully developed, but she did succeed in creating a wonderful tale. Her portrayal of women, particularly Sona and her obsession to become a mother, seems very real. And so is her wonderful transition of Nisha, from an innocent beauty to a strong willed woman. Even the male characters play a strong role in the storyline and are not receded to the background as usually happens in a women oriented book. Home is written in a simple flowing manner by the writer Manju Kapur and is very easy to read and enjoy.